Puddles thought in happy horror: We’re flirting! Jean Pond Cram (whose middle name, we learn in this sequel, is Martha) is a born Maniac, no matter what accent she has acquired. But although she was born in Maine, where are her real roots? She spent her teens in New Hampshire and her married life in South Carolina. Has she established roots in these other states? Or has she felt like a displaced person all these years? She had done every damn thing you’re supposed to do in the year after your husband dies. She had stayed put. She had kept working—at her two jobs, no less. She didn’t make rash decisions. She remembered to eat properly and to exercise. What do you do when your mother dies? First of all, you phone your best friends. Same as she had after Guy died. So Jean Martha Pond Cram, known since babyhood as Puddles, gave her father another hug and said, “I’ll be right back, Dad,” and left the waiting room of the Helmsdale hospital where he and her two brothers, her twin daughters, her two grandchildren, and her sister-in-law were milling helplessly around. As she walked outdoors into the sun of the South Carolina September afternoon, she felt tears on her face and realized that she’d been crying all the while she’d thought she was being strong and efficient. No, she wasn’t really crying, and she wasn’t weeping. She was seeping tears. But she must be strong and efficient. She was, after all, a nurse. An Advanced Registered Nurse Practitioner. In the crowded parking lot bordered by green lawns and flowering shrubs on a life-support system of sprinklers, she managed to remember where she’d parked her Toyota Camry. She dug her key ring out of her shoulder bag. With great concentration she thumbed the correct button on the remote to unlock the doors. Then she collapsed on the driver’s seat. Hot. She inserted the key into the ignition, switched the air conditioner up to full blast, and glanced in the rearview mirror to see if she looked as abandoned as Dad did. Her brown eyes were reddened and she looked paler than normal, her makeup worn off; her faded short brown hair needed shampooing to fluff it up because she hadn’t taken a shower during these past twenty-four hours she’d spent in this hospital. Otherwise, she looked like her familiar sixty-two-year-old self. She glanced down at her wrinkled shirt and khakis that had still been fairly fresh yesterday afternoon when she was working at Palmetto Family Medicine on Hilton Head and Dad had phoned her from the Helmsdale hospital, where she had worked years ago when she moved to South Carolina, before she became a nurse practitioner with her own office at the Helmsdale Clinic. The air conditioner’s chill made her think of morgues. A year ago, June 2000, after Guy’s death from a heart attack she had fled out of the Hilton Head hospital to the parking lot and phoned Snowy and then, using the number Snowy had given her, phoned Bev at a hotel in Boston. 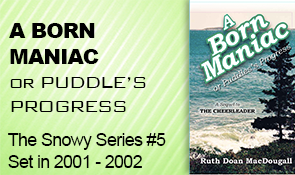 Now, hauling her cell phone out of her shoulder bag, she speed-dialed the New Hampshire number of Snowy’s Woodcombe General Store, knowing the caller ID would alarm Snowy because Puddles didn’t usually phone her at the store. “Mom has died,” Puddles told her. Hell, Puddles thought. Foot in my mouth. Snowy was still beating herself up over going to bed one night leaving her husband sitting up alone with the TV; Snowy had awakened the next morning to find that he had drowned himself in Woodcombe Lake because their general store was on the verge of bankruptcy. “Not yet,” Puddles replied. Beverly Colby Lambert, the third member of their triumvirate, was an orphan like Snowy, and like Snowy she had gone through a suicide fourteen years ago, but Bev’s mother had taken an overdose of sleeping pills because she was dying of cancer, which made sense. Dying wasn’t reversible, while bankruptcy might be. Bev’s father had been killed during the War, at Iwo Jima. “The others haven’t thought that far, but I guess I’m in charge, not Dad or my brothers.” Her brothers, younger than she, had always let her boss them around; Dad hadn’t, but now he was—abandoned, lost, in shock. Puddles studied the date on her watch, the date she would always remember, September 4, 2001. “Today is Tuesday. I’ll see if I can schedule the service for Saturday, the eighth.” Her brother Malcolm’s kids had to get here from California. “It’ll be at the Presbyterian church here, like Guy’s. Don’t feel you should come, you have to mind your store . . .” Puddles trailed off. In high school, Snowy and Bev used to tease her a little because she still occasionally went to church, Gunthwaite’s Congregational church. Snowy and Bev weren’t religious; Snowy’s parents had been Methodists, but Snowy was an atheist, and Julia, Bev’s mother, had been sort of vaguely Unitarian though as far as Puddles knew neither Julia nor Bev had ever gone to church. Bev hadn’t had any memorial service for her mother. Snowy hadn’t for her parents or her husband. Snowy had come to Guy’s memorial service at the church but she’d looked as out of place as a call girl in a gay bar. Only Snowy had flown down for Guy’s service because by then Bev had flown from Boston to England on her second honeymoon. England! St. Thomas in the Virgin Islands was where Puddles and Guy had gone on their first and only honeymoon forty-one years ago, Puddles finding “virgin” uproarious, since she’d lost that title four years earlier and not with Guy. But my biggest trip, Puddles thought, was after the honeymoon, moving to Helmsdale, Guy’s hometown. As she’d said at the time, it was like moving to the moon. Then, years later when Dad retired from his job as a foreman at the shoe factory, he and Mom had followed her, moving from Gunthwaite to Helmsdale. They had become real friends with Guy’s parents, become part of the community, had joined Guy’s family’s Presbyterian church. Then her brothers had settled here. One of her daughters, Susan, lived here with her husband and children. But when Guy, who was nine years older than Puddles, had decided to retire from his construction business, he got the urge to move to Hilton Head for oceanside golf. She had rebelled. Hilton Head Island was an hour and thirty-five minutes away from her family! She was used to having them nearby! But eventually she had given in. That had been another long trip, emotionally. Puddles glanced up at the hospital and saw Dad wandering out of the entrance, a slight man with thinning silver hair and silver-rimmed glasses. He halted and stood there alone amid people in wheelchairs being helped into cars. He must have decided that she wasn’t in a restroom and come hunting for her. “Yes, thanks,” she said hastily to Snowy, switching off the ignition, “could you tell Bev? Tell her Mom didn’t suffer.” Puddles prided herself on not sugarcoating things with her patients and their relatives, but in this case she had to. Dad lifted a hand to shade his eyes as he searched the parking lot for her car. Ralph Pond, age eighty-five, had no doubt believed the statistics and been sure that, though he was fit and trim thanks to all his golf and Mom was overweight, arthritic, with blood pressure that even the combination of Norvasc, enalapril, and hydrochlorothiazide couldn’t consistently lower, he must have been absofuckinglutely positive he would be the one to die first. Puddles herself had assumed he would be. Puddles got out of the car, semaphored her father, and hurried back to him.